Clarion Lodge Campsite & Wigwams01943 876300work Touring & Camping ParkIt’s ideally situated as a stopover point en route either North or South. Clarion Lodge Campsite now has Three 'Big Chief Wigwams' each wigwam can sleep up to five and are fully insulated with electric heating meaning our wigwams stay warm and cosy all year round. The little site with a big welcome. We shall certainly return, this site has become a home from home for us when we are on our travels. 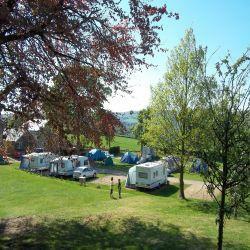 Such a friendly campsite, lovely views of rolling hillsides. Toilets and showers kept very clean, as people have said before there is just one shower however we didn't have to queue. The washing up and information house is lovely too. There is a Co-Operative store 5 minutes drive away in Menston and The Chevin pub up the road is lovely for a nice drink looking over those rolling hills. It’s ideally situated as a stopover point en route either North or South. This will definitely be on our list to revisit. The site can accommodate tents, caravans and motorhomes, plus there are three 'Big Chief' wigwams each sleeping up to five, fully insulated with electric heating. Children welcome from any age.